Carolina yellow jessamine flowers; photo by Images by John 'K' on Flickr (noncommercial use permitted with attribution / no derivative works). Selected not only for the flower's beauty and sweet fragrance, but because Carolina jessamine is found throughout South Carolina and "its delicate flower suggests the pureness of gold; its perpetual return out of the dead winter suggests the lesson of constancy in, loyalty to, and patriotism in the service of the State" (quote from South Carolina legislature). 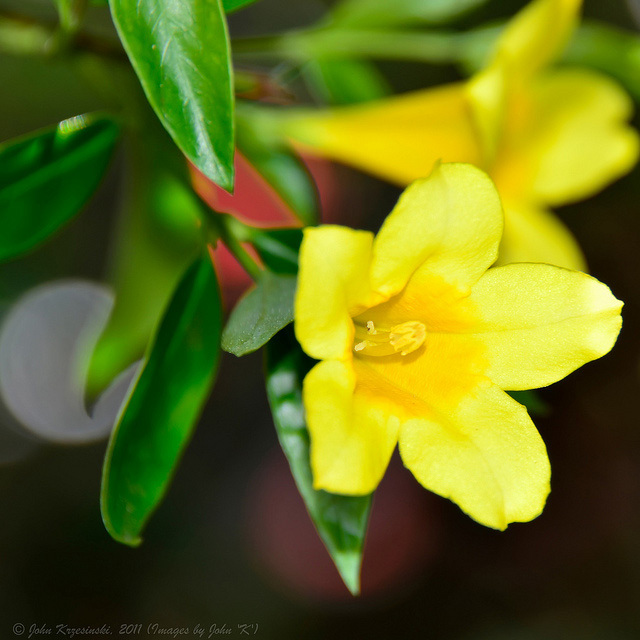 Yellow jessamine is also featured on the South Carolina quarter. Yellow jessamine is a hardy evergreen flowering vine native to southeastern United States (sometimes referred to erroneously as "Carolina jasmine"). It is beautiful but all parts of the plant are poisonous. 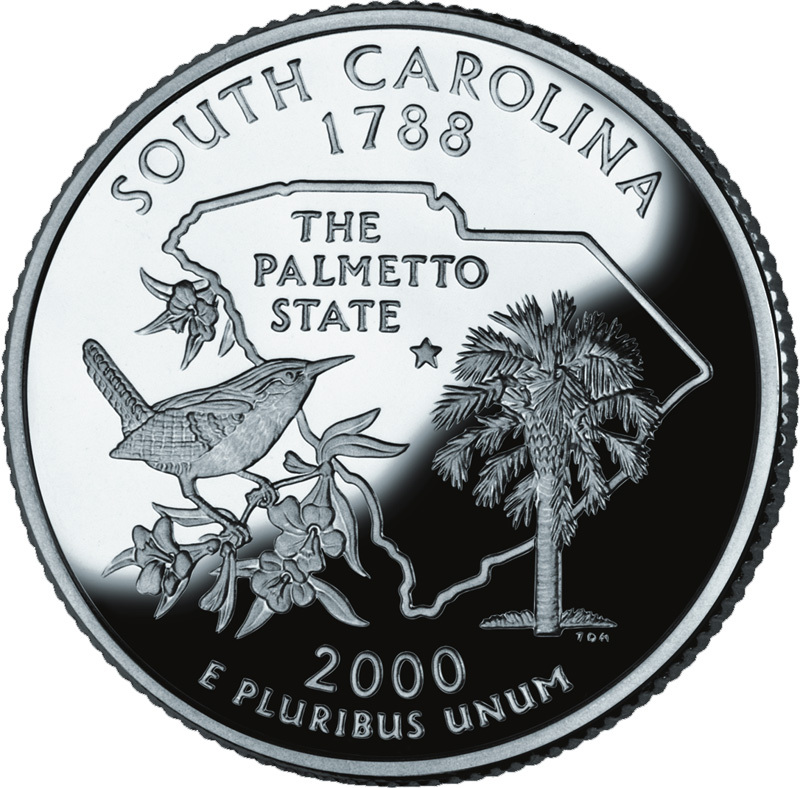 The U.S. Mint's bicentennial commemorative quarter for South Carolina features an outline of the state, the state bird (Carolina wren), state tree (sabal palmetto), state flower (yellow jessamine), and the state's nickname: The Palmetto State. South Carolina became the 8th state in 1788. Public domain image on Wikipedia. 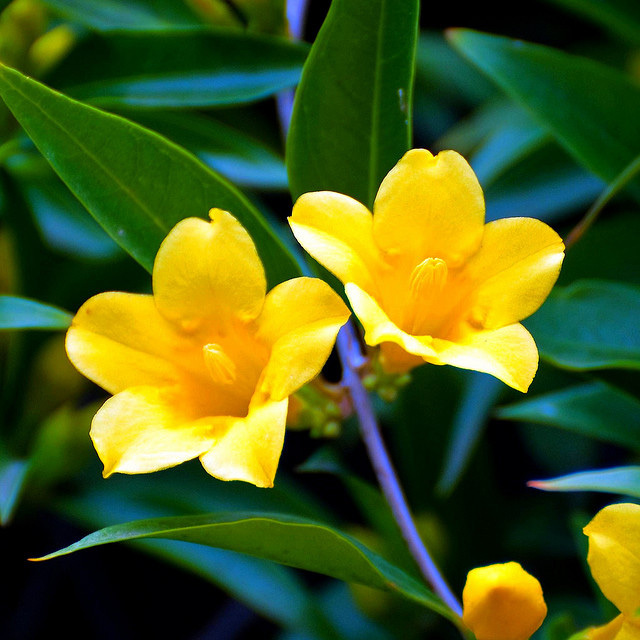 Carolina yellow jessamine flowers; photo by John 'K' on Flickr (noncommercial use permitted with attribution / no derivative works).